Whether it's to help the young pup that can't quite reach the bed, or the old dog that just doesn't have the energy to hop onto the couch anymore, our Pet Steps are there to help. 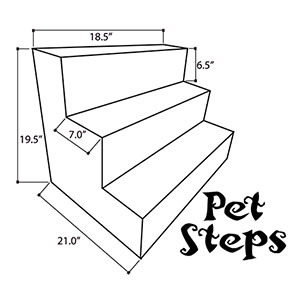 Made of light-weight dense foam, these steps are easy to move around, but invaluable for helping our 4-legged friends. The removable covers are available in a variety of fabrics and they are all proudly made in the USA.